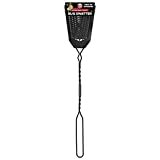 If you have an extraordinary intolerance for buzzing, biting and stinging flying insect pests, then give every fly, mosquito, gnat, wasp and other tiny winged invader that's annoying and/or attacking you a quick demise with a swift whack from this luxuriously cool new Leather Fly Swatter. 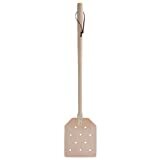 Most fly swatters are gaudy, cheap plastic items that you need to hide away when not engaged in battle with, but this one is crafted from fine Italian bridle leather with a handmade American Oak handle that you can proudly hang and keep close at hand. Fighting back endless squadrons of flying insects may seem to be an impossible mission, but when you wield this gorgeous leather insect flattener, you can at least take them down one at a time in style.